Tennis Elbow is the generic term for pain on the outside of the elbow, formally known as ‘Lateral Epicondylitis.’ Lateral means “outside,” the epicondyle is the specific section of bone that makes up the upper part of the elbow, and ‘itis’ means “inflammation.” The term ‘tennis elbow’ was first used in 1883 by HP Major in his paper “Lawn-tennis elbow”¹; and while it can be seen in sports that have repetitive movement of the elbow (such as tennis), the majority of people who get tennis elbow have never even stepped foot on a tennis court. According the American Physical Therapy Association, less than 5% of tennis elbow cases are tennis players. While online articles primarily relate the occurrence of tennis elbow to overuse or inflammation of the extensor tendon (the tendon that attaches to the outside of your elbow and connects down to the forearm) or to micro-tears that can develop in the extensor muscles,²,³ there is a significant amount of research that has shown a lack of evidence that this occurs in many tennis elbow cases.5,6 Therein lies the mystery of this condition. Uncovering the true source of your pain is vital to receiving the proper treatment; that is what we do at Cioffredi & Associates. Symptoms can be brought on suddenly by excessive use, or forceful activities such as a sudden pull of the lawn mower cord, or from prolonged repetitive strain, however, it more often occurs without a specific precipitating event. Myofascial pain is pain that arises from trigger points especially within muscle as detailed by Travell & Simons.4 Trigger points are an area of hyperirritability usually within the top band of skeletal muscles, connective tissues or fascia. They are painful when you press on them and can give rise to a characteristic referred pain away from the area that you’re pressing on. A number of muscles in the arm can give rise to lateral elbow pain, not limited to: the supinator, triceps, brachioradialis, extensors of the wrist, extensors of the forearm, and even the scalene muscles about the neck. Nerve irritation from the radial nerve can cause pain in this area. 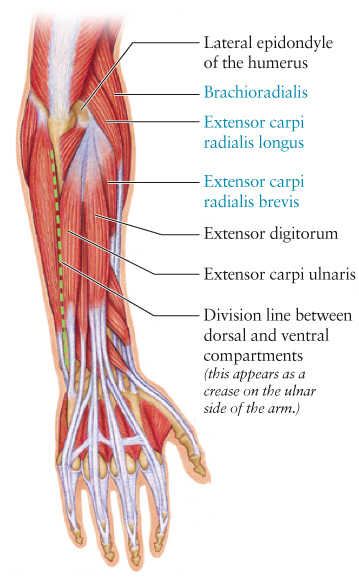 The radial nerve passes right through the supinator muscle and can be a source of entrapment/compression from this, or other muscles nearby. Joint restrictions at the elbow. Given these varying causes, and the misconception that this is primarily an overuse injury, it may not be a surprise for you to hear of a number of personal stories where people did not improve with treatment, took many months to finally improve, or their pain never completely resolved. This may be because the treatment they received was not targeting the true cause of their problem. The successful treatment of these various causes is not the same. For example, stretching tight wrist extensor muscles may be helpful in someone that has a muscle condition, but it will aggravate a nerve condition. Similarly, working to fully straighten an elbow that is stiff may aggravate it if the joint is pinching and jamming from joint restriction. While strengthening weak muscles is generally helpful, it can aggravate a muscle that has a hyper irritable trigger point. Our success in treating lateral elbow pain comes in taking the time to uncover the true source of the pain. Each person’s case and each person’s story are unique, and we treat no two cases the same. Travel, Janet MD & Simons, David MD. “Myofascial Pain and Dysfunction: The Trigger Manual”. Volumes 1 & 2 (1992). Williams & Wilkins.